We encourage everyone to come out to the demonstration we're hosting from 11am-2pm on UT's West Mall rally area and/or the presentations by Michael Badnarik and Torin Wolf that evening at 7pm in GEO building 3.324. Please bring yourself and a friend, family member, or anyone you find dear. We'll be passing out plenty of dvd's and handouts, as well as holding signs and displaying our installation of the twin towers and building 7 (picture attached). AUSTIN, TX - UT Student organization, The Project for the New American Citizen (PNAC), will hold a rally and a series of presentations on Tuesday, September the 11th, from 11am to 2pm on the West Mall, just west of the UT tower, and 7pm at the GEO Building 3.324 of the University of Texas at Austin's campus. The organization will be raising awareness about the on-going cover-up of the attacks of September the 11th, 2001. PNAC Plans to Raise an Inflatable Art Installation of the Twin Towers and World Trade Center Building 7 (image attached). The installation is approximately 10 feet in height, and is covered with quotes from numerous founding fathers, Presidents, and philosophers. 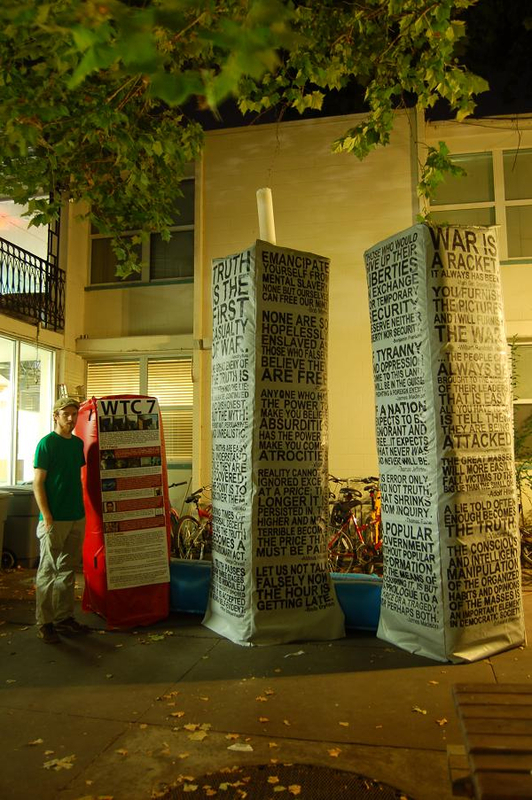 The organization hopes to draw the attention of UT's student body to encourage public discourse of the events of 9/11/01. Former Presidential Candidate and Iraq War Veteran will give Presentations at 7pm. Michael Badnarik, the 2004 Libertarian Presidential candidate, will speak on legislation passed post 9/11/01; Iraq War veteran and former demolitions specialist Torin Wolf will speak on the physical evidence of the collapse of the Twin Towers and World Trade Center building 7.
for not investigating anomalous collapse of World Trade Center 7. Tomorrow we stand united for truth, and I couldn't be happier with whom I stand beside. I hope I get to see you again one day so I can take you up on that drink. Daricus on Mon, 09/10/2007 - 10:14pm.